The Sauce that started it all. Original Blend was created in 2006 by MRP’s founders for Jamaica’s Trelawny Yam Festival, where it won a bronze and silver medal in the culinary competition. 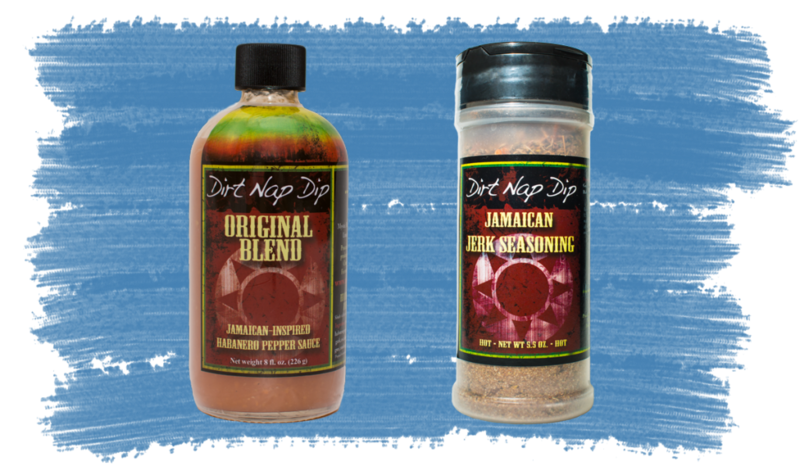 Sweet and tangy with a dash of heat, Original Blend is a great way to introduce the Dirt Nap Series to your kitchen. Use as a table sauce or add to your favorite recipes. This seasoning rub is MRP’s take on a world-famous Jamaican culinary staple. Traditional Jamaican seasonings and habanero peppers are blended together to create a Caribbean delight perfect for your backyard summer barbeque. The MRP team can think of nothing more mouthwatering than the smell of jerked meat roasting on a hot grill. Traditionally used on pork and chicken, let your imagination run wild with the Jerk. These MRP kitchen classics are available through special order only: Dirt Nap Dip Devil’s Blend hot sauce, Trelawny Red Spicy BBQ Sauce, Lava Ground Spicy Bean Dip, Trelawny Gold Spicy Mustard, Red Ninja Salsa. Keep an eye out for the Commissioner’s Choice – 4 selections from the Dirt Nap product line in one delicious package. What you get is up to the Commissioner.